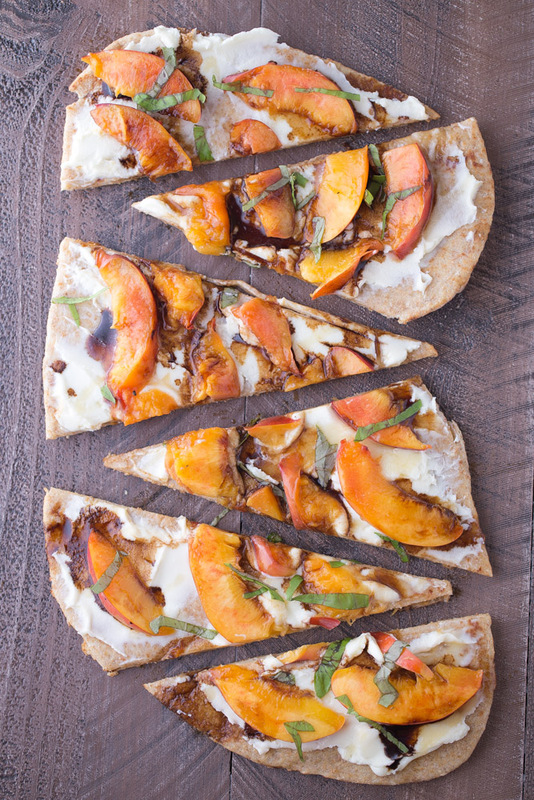 Let’s celebrate our love of stone fruit by enjoying a slice of this Grilled Nectarine Flatbread. 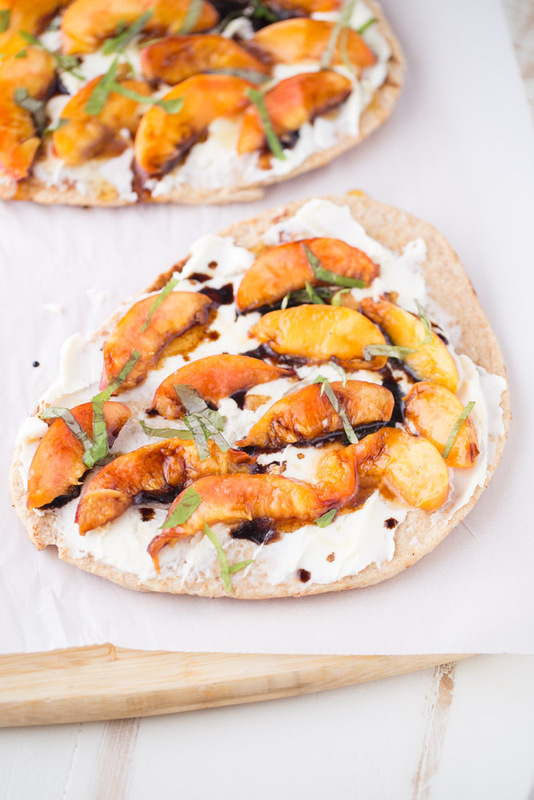 Whole grain flatbread naan is topped with creamy mascarpone cheese, grilled juicy nectarines, tangy balsamic reduction, sweet honey and fresh flavorful basil. What’s not to love? But before we get to the recipe, let’s talk about tea and coffee. Because most of us love a hot cup of tea or coffee in the morning. And because this grilled nectarine flatbread wants you to enjoy it with a cuppa hot tea or coffee. Which will it be for you, my friend? I’ll take a cuppa hot green tea with mint and lemon, please. I used to be one of the worlds biggest fans of coffee. And before that, I was one of the worlds biggest fans of not drinking coffee. When I was in high school, the only way I’d take my coffee was loaded with Irish Cream coffee creamer and multiple packs of sugar. Why yes, I’ll take a few drops of coffee with my Irish Cream coffee creamer. My friends and I would meet up at IHOP during the weekends to chat, goof off and drink coffee. Wait, drink coffee? But I do not like coffee. My coffee loving friends suggested I load up on the flavored coffee creamers and sugar. I took their advice. The coffee was tolerable. But it wasn’t something I completely enjoyed or even slightly craved. Fast forward 10 or so years to when I met Ken, who happens to be one of the worlds biggest fans of coffee. His magical powers turned me into a coffee lover. Just kidding. He doesn’t really have magical powers but he did teach me the tricks of the coffee ordering trade. Soon I was taking trips on my own to Starbucks or the local coffee shop and ordering my favorite hot coffee beverages, the creamy caramel macchiato or the simple and delicious cafe latte. I still love a good cup of coffee, and I will never get over the enjoyable aromas that coffee emits, but now my heart belongs to hot tea. It’s delicious. It comes in 721653156 flavors. It’s okay to take it decaf. I don’t need to add milk or sugar to it in order to enjoy it. It doesn’t bother my stomach. 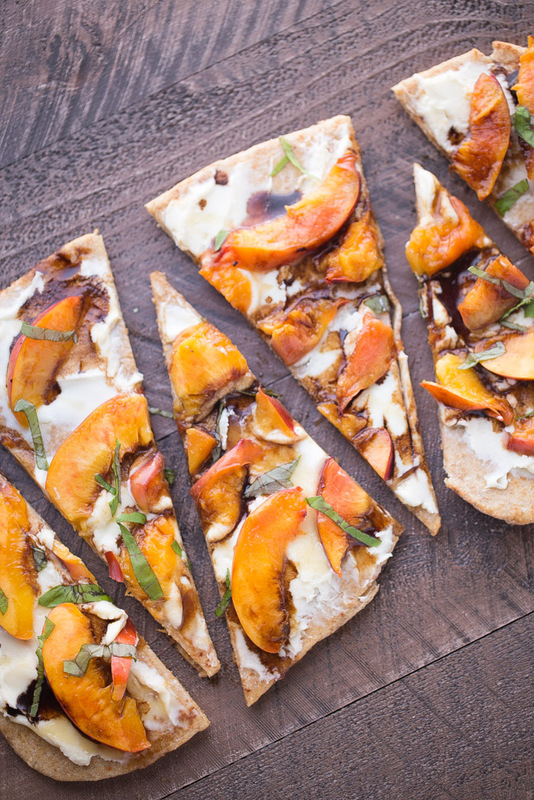 The idea for this Grilled Nectarine Flatbread was born from my love for stone fruit, specifically nectarines and peaches. 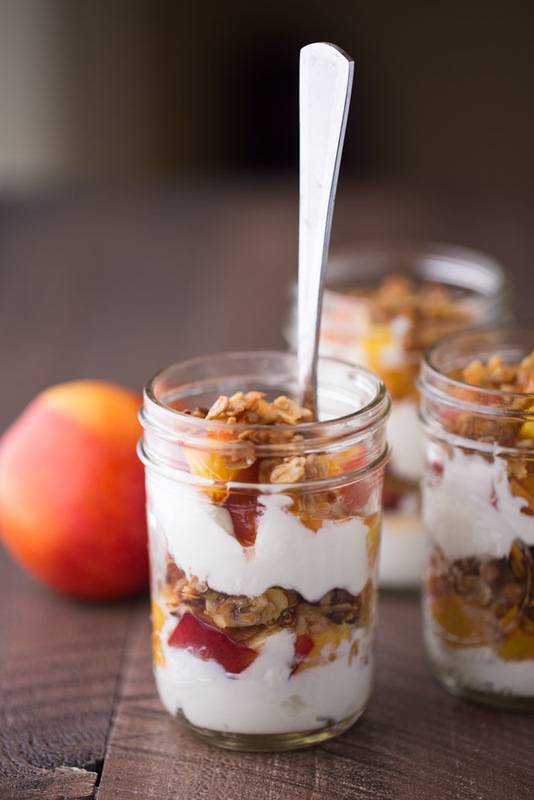 Nectarines have been winning lately, making it into my shopping cart on more than one occasion. This isn’t necessarily a healthy recipe, but it’s made with fresh fruit and ingredients. I consider it a better appetizer option than meat and cheese filled appetizer trays, fried foods and cookies and cakes. To make this grilled nectarine flatbread, you’ll want to start off by preparing the balsamic reduction. I recommend turning on the oven and ceiling fans as preparing balsamic reduction will make your house smell like vinegar. This step takes around 15-20 minutes to complete, which is perfect because during this time, you’ll grill the nectarines, warm the flatbread and chop the basil. Once your done prepping everything, spread the mascarpone on the flatbreads and top with the grilled nectarines, honey, balsamic and basil. Then it’s time to devour and enjoy. Place the balsamic vinegar in a small sauce pan and bring to a boil. Reduce heat to medium-low and simmer 10-15 minutes or until reduced by half to ¾, depending on your consistency preference. Heat a grill pan over medium heat. Spray lightly with cooking spray. Place the nectarines cut side down and cook for 5 Minutes. Remove from grill pan and allow to cool for a few minutes. Then slice into wedges. Place the flat bread directly on oven grate of the preheated oven. Bake 2-3 minutes. Remove from oven and place on a cutting board or serving plates. Spread 2oz of mascarpone cheese on top of each flatbread. Top with the sliced nectarines, distributing evenly. Then drizzle with balsamic reduction and a little honey. Sprinkle with the chopped basil. Cut each flatbread into five slices. Wow this is beautiful and such a great light lunch idea. I love the grilled peaches with the mascarpone. Also, I wanted to mention how much I love the simplicity of your blog and how clean and beautiful the photos are! Aww thank you so much, Julia! I really appreciate your sweet comment and compliments. :) Hope you have a lovely weekend! I seriously love everything about this flatbread! I’ll take coffee with mine please :) But seriously. This looks incredible! I love grilled fruit! These flatbreads look amazing! This grilled flatbread sounds wonderful! I love grilled nectarines! This grilled flatbread sounds fantastic, Julie! Ah, and these grilled nectarine looks so damn delicious! Awesome share! I am actually weird, and I will only drink ICED coffee… 365 days of the year, snow or shine. Iced coffee all the way. :) But, I do love hot tea. Sleepy time or green tea are my favs! Anyways, I Looooove these flatbreads, Julie! Like, love love love EVERYTHING about them! Adore that you used naan- because yes! Naan rocks the house! Love that it’s grilled! And, OMG to all the toppings!! Mascarpone, nectarines, balsamic, honey AND basil? Talk about FLAVOR TOWN! This is amazing, girl! Can’t wait to try it. With my iced coffee :) <3 Pinned! Thank you so much for stopping by and for your lovely comment. Hope you love these flatbreads as much as I do! Such a great idea Julie! I recently tried grilled peaches on a pizza, but now I must try your recipe with mascarpone! Pinned! Thank you so much, Alison! Your blueberry nectarine galettes sound amazing. I’ll have to check them out! I’ll bet this would be a brunch showstopper. Absolutely gorgeous. I bet it would be, too! Thank you so much! Wow, this looks delicious! I was thinking of doing this with pizza dough, but using flat bread is so much easier! Thank you, Chloe! Using the flatbread is so much easier! I want to be a tea drinker, I just can’t do it. I try every so often because I like the idea of it, but it never works. I drink black coffee most of the time, with an occasional treat drink. This flatbread looks amazing. I love all of the fresh fruit this time of year and this looks like a fresh and delicious way to enjoy it! Oh how I wish I could enjoy black coffee, Carlee! A friend of mine said she recently started drinking black coffee. She said it gets easier over time. Maybe one day! :) Thank you so much for stopping by. I hope you have a lovely weekend! Pingback: Great Ideas -- 20 Unique Recipes! You photographed this unique treat so well, I really want to make this! I hear you on the love of peaches and nectarines and with the combination of ingredients I think nectarines are the right choice. Pinning to my appetizer board now for future entertaining. Aww thank you so much, Joann! Pingback: 6 Grilled Desserts Under 200 Calories – user's Blog!